Bricks, bottles and firecrackers were thrown at police officers who were present in riot gear at the scene. Just after 2000 BST, police said there were a small number of people in the area. Mobile patrols were continuing in a bid to reassure residents. Earlier, hundreds of youths, some covering their faces with scarves, were in the area and there were skirmishes with police as some demonstrators broke a police cordon. Supt Julia Pendry said police had to "intervene" to stop things from "escalating". She said: "Officers came under attack from bricks and bottles and we had to deploy our staff in protective equipment a number of times. "Police had to take fast-time action to stop events from getting even worse this afternoon, by intervening to prevent an imminent breach of the peace. "What played out on the streets of Harrow today is completely unacceptable to everyone," she added. Stop Islamification of Europe (SIOE) said they planned a "peaceful protest" against the building of a five-storey mosque next to the Harrow Central Mosque. But in a message on their website SIOE said the protest had been called off and organiser Stephen Gash had been arrested. The posting read: "If you are on your way to the demo, don't go, it's being called off right now. "The police can't handle the Muslim counter-demonstrators. The senior sergeant said that he doesn't want any of his policemen killed." Nine people remain in custody after being arrested for possession of offensive weapons including a hammer, a chisel and bottles of bleach. Another person was arrested at the scene to prevent a breach of the peace, but he was released soon after, police said. Police also stopped a number of people, who they believed were heading for the anti-Islamist protest, from getting to the protest area. "If the SIOE demonstration started it would have resulted in serious disorder," a statement from police said. 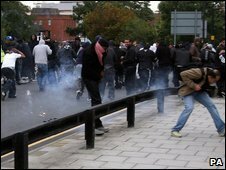 Councillor David Ashton, leader of Harrow Council, said: "We are saddened and dismayed that groups from outside the borough have come here and caused unrest. "Harrow has an excellent record in community relations and we condemn those who came to our borough from elsewhere to either foist extreme political opinions on us or use religion as a cover for causing trouble."